Join poets, playwrights, friends, collaborators and former students of Derek Walcott as they pay a celebratory tribute to the Nobel Laureate who died last year. Walcott would gather friends from across the seas every year to celebrate his birthday. Adam Zagajewski (Poland), Matteo Campagnoli (Italy), Wendell Manwarren (Trinidad), Stephanos Papdopoulos (Greece), Maria Cristina Fumagalli (Italy/UK) and Caryl Phillips (UK/St Kitts), read Walcott’s poetry and poems he loved and reminisce in this evening of readings, performance and informal conversation. Matteo Campagnoli is an Italian poet and translator. His poetry collection, Inuna note fortunate is published by Edizioni Casagrande and his travelogue Dispacci dai Caraibi;St. Lucia, Trinidad e Martinica is published by Quodlibet/Humboldt. Since 2007 he has headed the research section of Babel, Festival of Literary Translation and is one of the co-founders of the online magazine Specimen. He has translated the works of Derek Walcott and Joseph Brodsky for Adelphi and, for Edizioni Casagrande, the works of Stephanos Papadopoulos, Jacek Dehnel and David Foster-Wallace. He worked closely with Derek Walcott on the staging of Odyssey (Ortigia Festival 2005) and Moon-Child (The American Academy in Rome). Maria Cristina Fumagalli is Professor of Literature at the University of Essex. She is the author of The Flight of the Vernacular: Seamus Heaney, Derek Walcott and the Impress of Dante and Caribbean Perspectives on Modernity: Returning Medusa’s Gaze. She is currently working on a monograph on Derek Walcott, provisionally entitled Derek Walcott’s Painters, it focuses on the Walcott’s relationship with the visual arts. Maria Cristina also worked with Derek Walcott. co-producing a number of his plays which he directed. Wendell Manwarren is a Trinidadian singer, writer, actor, producer, teacher, sound designer and director. Having cut his teeth as a member of the now defunct Trinidad Tent Theatre under the direction of Helen Camps, he has since gone on to work closely with such luminaries as Peter Minshall and the Callaloo Company, Derek Walcott and the Trinidad Theatre Workshop and Noble Douglas and the Lilliput Theatre. He is founding member, performer and producer with the cutting edge Rapso crew 3canal. His theatrical productions have won awards both locally and internationally. Glyn Maxwell is a poet, playwright, novelist, librettist and critic. His volumes of poetry include The Breakage, Hide Now, and Pluto, all of which were shortlisted for either the Forward or T. S. Eliot Prizes, and The Nerve, which won the Geoffrey Faber Memorial Prize. His collection, One Thousand Nights and Counting, was published on both sides of the Atlantic in 2011. He has a long association with Derek Walcott, who taught him in Boston in the late 1980s, and whose Selected Poems he edited in 2014. Stephanos Papadopoulos was born in North Carolina in 1976 and raised in Paris and Athens. He is the author of several books of poems: Lost Days, Hôtel-Dieu, and The Black Sea, as well as the editor and co-translator (with Katerina Anghelaki-Rooke) of Derek Walcott’s Selected Poems into Greek. He was awarded a Civitella Ranieri Fellowship for The Black Sea and he received the Jeannette Haien Ballard Writer’s Prize, selected by Mark Strand. In 1998 Derek Walcott invited him to the inaugural Rat Island Foundation event, beginning a 20+ year association as a mentor and dear friend. Adam Zagajewski, poet, novelist, essayist and translator, was born in Lvov in 1945. His books include Tremor,Canvas, Mysticism for Beginners, Without End, Two Cities, Another Beauty, A Defense of Ardor and Eternal Enemies. He was awarded the 2004 Neustadt International Prize for Literature, The Prix de la Liberté, The Griffin Poetry Prize Lifetime Recognition Award and the 2017 Princess of Asturias Award for Literature. Caryl Phillips is the author of both fiction and non-fiction, including The European Tribe, Crossing the River, A Distant Shore, Colour Me English and most recently A View of the Empire at Sunset. He was born in St Kitts, grew up and was educated in Britain, and now divides his time between Britain and the United States. His awards include a Guggenheim Fellowship, The James Tait Black Memorial Prize, the Martin Luther King Memorial Prize, the Commonwealth Writers Prize, and the Pen Open Book Award. His close friendship with Derek Walcott extended over 30 years. Martina Laird is probably best known as the tough and sassy Comfort Jones in the BBC’s Casualty. Born in Trinidad, her many television credits include the recent Jericho, The Bay, EastEnders and Shameless. Her stage credits include the lead role of Pearl in Shebeen (Nottingham Playhouse), All’s Well that End’s Well and Romeo and Juliet (Shakespeare’s Globe Theatre), Coriolanus (RSC), Phyllida Lloyd’s Shakespeare Trilogy (Donmar Warehouse), Who Cares (Royal Court Theatre), The House That Will Not Stand (Tricycle Theatre), Moon on a Rainbow Shawl (National Theatre) and Derek Walcott’s Starry Starry Night ( Lakeside Theatre, Essex). Sunday, January 14 | 2:00 p.m. Poet Stephanos Papadopoulos will read from his work during January’s Second Sunday, the library’s monthly celebration of the written word. Papadopoulos was born in North Carolina and raised in Paris and Athens. 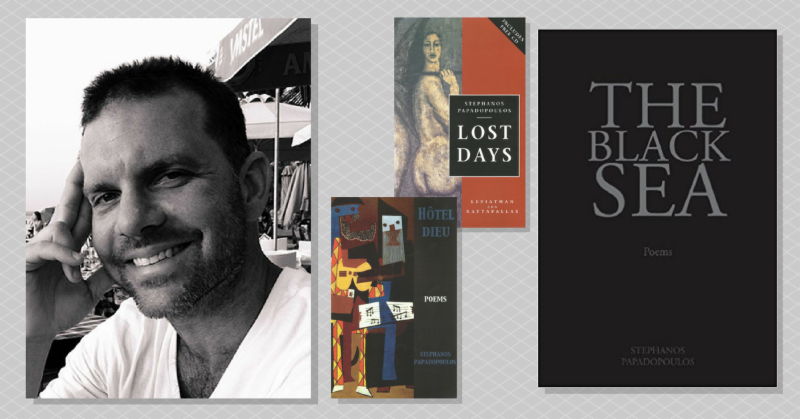 He is the author of four books of poems: Lost Days, Hôtel-Dieu, The Black Sea, and Carrboro Station (forthcoming). He was awarded a Civitella Ranieri Fellowship for The Black Sea and in 2014 was awarded the Jeannette Haien Ballard Writer’s Prize selected by Mark Strand. He has been awarded a Lannan Foundation Fellowship in Marfa, Texas, in 2018. The Black Sea, his most recent published collection, is a long poem-cycle about the Black Sea Greeks and their exodus from that region. The Black Sea explores the historic “great catastrophe” of the Pontic Greeks of Asia Minor in the 1920s through a series of “sonnet-monologues” or voices from the past. Priests, prostitutes, soldiers, and a bizarre cast of characters move through this poetic re-imagining of a tragic chapter in Greece’s history.